Today was our last day with our hire car and we'll be putting it to good use with our planned trip down to the famous shrines and gorge of Takachiho! We’d then use the car to drive to Kumamoto as the first leg of our long journey up and around to Nagasaki. Unlike most other places we've visited with the car so far, Takachiho is not easily accessible with public transportation as the bus trip is long and infrequent. The gorge and one of the shrines are not too far from the bus centre (half an hour walk) but the other shrine is located around ten kilometres away. So a car makes the most amount of sense. There actually used to be railway line that ran into the town but it was unfortunately washed away by a typhoon in 2005 and there was not enough funding available for repairs. As usual we wanted to get going early so we made sure to pack up all our things into the car before breakfast. We were not the only ones busying about early in the morning; we noticed the owner was setting up some big event (perhaps a wedding reception?) in an attached hall. Kate was really hoping for bacon and eggs for breakfast, but it was probably a bit of a naive wish with the French styled dining. 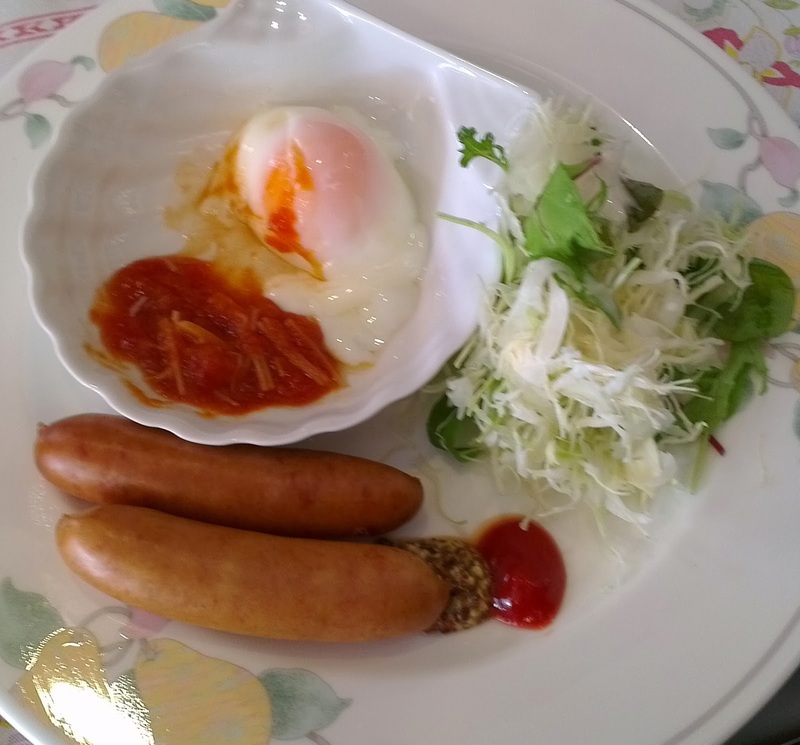 What we got were some sausages with a weird tomato sauce and pouched eggs. It was actually pretty close to bacon and eggs but neither of us really liked the sausages- the eggs were nice. 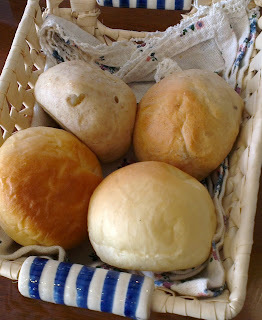 Otherwise we also received some yoghurt, fruit, juice and more delicious bread. Oh and cabbage. Because, Japan. After breakfast we settled our debts (wine) at reception, checked out and hit the road. We got off to a bit of a confused start as our cars GPS completely freaked out because the road from the Auberge Mori No Atorie Minamiaso Luna Observatory hotel wasn't on the map. Kate was driving and after passing some confused locals in tiny back streets, managed to get us back to the main road. Takachiho isn't located on the scenic Yamanami Highway we'd been following for the last few days, but we still drove along some nice pretty roads on our forty kilometre (one hour) journey down to the neighbouring Miyazaki Prefecture. The theme was tall, sometimes curving bridges spanning narrow valleys and gorges, which makes sense considering our destination. I also remember a few tunnels and a tractor or two. Apart from the gorge, Takachiho is the location of mythical story where the Shinto sun goddess hides in a cave after being cruelly teased by her brother. This act deprives the world of sunlight and the other gods were not able to lure her out until one of the goddesses dances a dance that causes everyone to erupt into laughter. Hearing this commotion Amaterasu left the cave to investigate what was going on and therefore brought light back to the world. This story, and other adventures of the gods, is reanimated yearly in Takachiho as Yokagura (夜神楽 = Night + Gods + Music ) performed over thirty three episodes between November and February. The actual cave is said to be located at the Amano Iwato Shrine while the Takachiho Shrine is the nightly location of a hugely shortened version of the drama. Along with Mount Takachiho-no-mine in Kirishima, Takachiho also claims to be the location where Amaterasu’s (the sun goddess) grandson Ninigi descended from heaven to eventually become the great-grandfather of Jimmu, Japan’s mythical first emperor. After arriving at the town of Takachiho we decided to first follow the signs and head straight for the gorge. The route down was a very steep and narrow one-way road which for some reason was used for two way traffic, thankfully we didn't encounter anyone coming back up. There are a number of car parks located at the bottom and they're well managed to deal with the thousands of visitors that arrive every day. At the end of the road down we were directed over to one of the nearby car parks and into a bay. As usual for Japan we had to pay but happily it wasn't very expensive and we could stay for the whole day. Takachiho Gorge (高千穂峡) was formed when the Gokase River carved out a narrow chasm in a thick layer of lava. An eruption of the Mount Aso volcano was actually responsible for the deep river molten rock which subsequently cooled to produce columnar basalt. The hexagonal columns resemble the scales of a dragon and were formed due to contraction in the cooling rock. So, as the lava cooled it shrunk, and the shrinkage caused the whole layer to become shorter in the vertical direction. However, as this shrinkage cannot be accommodated in the much more extensive horizontal direction, many cracks formed instead and produced the thick vertical columns. The columns in this type of basalt vary in thickness depending on the rate of cooling and the thick pillars of Takachiho’s basalt indicates that the lava cooled relatively slowly. The Gokase River continues to flow through the gorge and various tributaries contribute to the flow via impressive waterfalls that cascade down the cliff walls. The river is pretty calm and a popular activity involves hiring a rental paddle boat to row along and enjoy the gorge from water level. Up at the ground level, a walking trail enables you look straight down into the gorge from an entirely difference perspective. When we arrived we had a quick look around the upper section where we found a few shops and Nagashi Sōmen (flowing noodles), but we quickly decided to head down to the boats as they were not yet crowded. This turned out to be very good idea as we later found that the waiting time increased to over an hour. The boat transfer area was well signed and it cost us 2000 yen to hire a boat for thirty minutes. The payment kiosk was located at the top of some stairs that we climbed down with our riding ticket to boats at the bottom of the gorge. When we arrived there were still unused boats available which meant we could start straight away. I think we were told not to capsize the boat, stand up, lose the oars, or row upstream past a barrier. We were also given life jackets to put on so we wouldn't drown. I was put in the forward rowing position and Kate sat in the rear navigator seat. The boat was really fun and the wet waterfall adorned gorge looked really beautiful! I actually really sucked at paddling the boat to begin with though as I somehow thought it would be a good idea to use both paddles in both directions and became really confused. I tried to turn by paddling one paddle forwards and the other backwards but only managed to succeed in not moving the boat at all. Which is a pretty awful achievement. Kate had plenty of scorn for my efforts and eventually we agreed to swap places- which was really scary as although we didn’t stand up the boat wobbled a lot! Kate then showed me how to do it- basically you paddle in one direction only and to turn all you need to do is paddle on one side. With Kate's improved paddling we were soon underway down through the gorge. The rocks were really pretty and blocky. It was also nice and cool down here and the mist from the waterfalls was lovely to watch. The boat wasn't leaky or anything either so we were able to stay nice and dry- we made sure not to go too close to the waterfalls. There was a fair amount of other boats though as everyone spread out along the river it wasn't too crowded. However at one narrow point we nearly had a crash with one of the other boats! After the tall and reasonably wide section with the waterfalls we came to another area that was narrower and had a few shorter columns of rock. Most people didn't continue too far through this section and from what we could see only one other boat traveled further than us at the time. The half an hour we had was going quickly and we were soon turning around to head back up the river. After turning around we once again braved the wobbles to swap places to I could have another attempt at rowing. Kate made sure to bark orders at me and I managed to pick it up alright. I was actually able to pick up some speed! On the way back up we saw one of the operators in a powered rescue boat towing a row boat containing a man who looked very sheepish. Apparently he had become stuck after dropping one of his oars into the river. I wondered how deep the water was and if they'd be able to recover it? Lots of people had been arriving while we were rowing and as we rowed we could see them filling out along the path at the top of the cliffs. We arrived back at the boat transfer area right on time and after a wobbly disembarking process we were back on dry land. So now it was time to climb up a heap of stairs to change perspective and enjoy the gorge from above! It still wasn't time for Nagashi Sōmen so after reaching the shops we found the path and walked around and along the top of the cliffs. Near the start there was a bit pond full of carp and you could pay a small amount for some feed. I paid some cash for the pellets and scattered them around only to find that the fish were not interested at all! It was pretty crowded up along the path and there were lots of long tour groups led by guides holding flags. The trail itself was really nice though and we were able to get excellent views down into and along the jagged Takachiho Gorge. Along the way there were a few features indicated and explained in Japanese such as the pot hole and the Manai waterfall (one of Japan’s 100 best). I also noticed that there looked to be at least two eruption events recorded here and we could see a differently oriented layer of lava overlying the thick lower pillars. This upper layer had thinner columns so it probably cooled faster as well. At the end of the path we found three bridges with each higher bridge longer than the one below. We used the lowest old stone bridge to cross back over to the other side of ravine. Before that though, we found a map listing all the good touristy sort of things to enjoy in Miyazaki Prefecture. There were lots of fun looking activates mentioned, including islands, waterfalls and a cape with horses; we made sure to take a picture for future trip ideas! To the left of the sign we found a restaurant and to the right was the bridge leading to a path that another sign indicated lead up to the Takachiho Shrine. The shrine was located in the town and we had originally planned to drive there after finishing with the gorge. However, since we had already come this far and were a bit worried about parking availability, we instead decided to continue along the path and walk up to the shrine instead. Right at the start of the trail there was a sign warning us to watch out for falling stones! Although we were at the top of the narrow chasm containing the river we were still pretty much at the bottom of the greater ravine so we had to climb a total of 441 stairs to reach the town level. This was in addition to the 203 stairs we had already surpassed so far. It was pretty exhausting and perhaps the number should really be large as many of the stars were really high (so should count for two). I remember that some eight hundred step church buildings we climbed in Europe had really tiny little bumps that made the floor almost a ramp. Apart from these high steps there were also a lot of long ones which were a bit annoying as it meant we were always pushing up with the same leg. Anyway, after our invigorating climb we finally reached the shrine! Takachiho Shrine is a Shinto shrine founded over 1200 years ago and is known as a place of spiritual importance. It is most famous as the location of nightly Yokagura dances that are a shortened version of the epic dances that take place yearly over a few months. The dances recount the story I described above about how the sun goddess hid in a cave until the gods managed to lure her out. We found the shrine nestled amongst a grove of extremely tall cedar trees, one of which we learnt was 55m tall and over 800 (!) years old. The shrine itself consisted of a number of unpainted buildings including a large hall where the nightly Takachiho Yokagura performances are held. We were invited to come inside to have a look but decided to stay outside as we were wearing our big heavy boots and didn't really want to take them off. We could see inside pretty well anyway. After having a look at the main hall we left the complex to buy some drinks from a vending machine across the road and when we returned we accidently ended up near the monks living quarters. We quickly exited from that area and looked around for some public toilets. 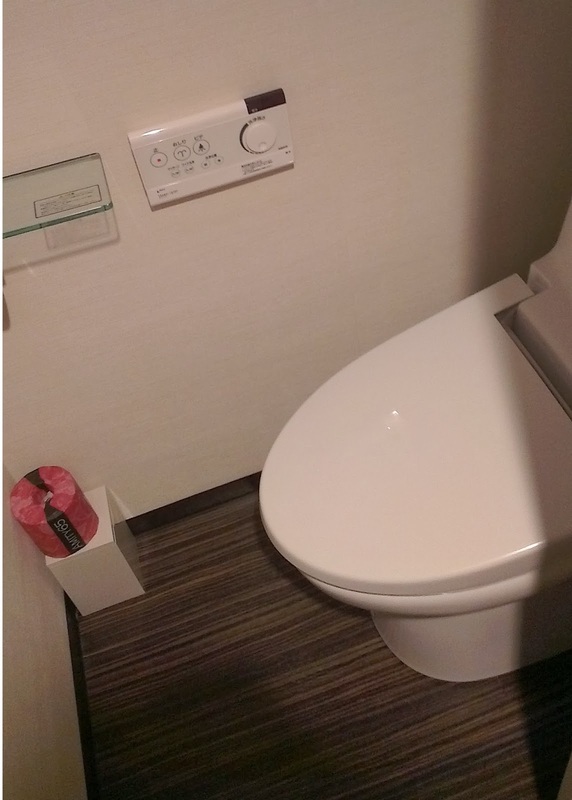 As we walked down some Japanese ladies tried to stop us saying that they were squat toilets and didn't seem to get it when I replied that we didn't mind. It would have been fantastic to watch the play but as it's only played at night we'd have to back some time in the future. As it was now we'd seen just about everything and it was time to head back down the stairs to the gorge. Once we got back it was finally time for some Nagashi Sōmen!! Before entering the restaurants we had a look at a few of the fishing ponds out the front but unfortunately I found a sign stating that they were not open today. The lady out the front practically dragged us in and seated us along one of the long bamboo half pipes filled with flowing water. The pipe started in the kitchen, angled down to a little catcher at the end and the idea was that we'd use chop sticks to catch the noodles as they shot past. The shoot wasn't one long section but was also gradually stepped down with a couple of miniature waterfalls. It seemed a little unhygienic to me though I'm absolutely crazy when it comes to those things so I think most other people would find it fine. I still did it. Some people were seated further up from us but we were relieved to find that each couple got a separate bamboo shoot. There was also lots of antiseptic liquid around so presumably the shoots were frequently sterilized. To flavour our noodles we were given some dipping sauce and once both groups were ready the lady shouted out "Let the noodles flow!" in Japanese. After a bit of a pause the noodles shot down in two blobs! We quickly decided that Kate would go for the first bundle and me the second. We found that the trick was to put the chopsticks in the shoot to slow the noodles down and scoop them up as they came past. As long as you know how to use chopsticks it isn't that difficult and although the noodles travelled rapidly they were not too fast to catch. Generally it didn't seem like we lost any and were able to pick up the whole bunch, with maybe an occasional one or two strands slipping by. The biggest challenge was making sure to eat them before the next bunch came which was increasingly difficult as the interval between bundles decreased. The noodles were cold but tasted alright after applying, or rather, dumping them in our dipping sauce. Eventually I actually ended up with a fair few noodles stored in the little bowl. All up a pretty large amount of noodle came down and we caught all but one of the blobs- my fault as I had thought it was Kate's. We both watched that one sail past us and off the end of the shoot. Once the last of the noodles were unleashed it was time for us to find out how we had done and the lady went over to the end and showed us the basket full of our missed noodles. I saw an Oni at the gorge! It turned out that we had missed way more than we had thought! There were maybe three of four big blobs worth that somehow managed to sneak past- mostly the one or two strands that got away I suppose. The Japanese couple next to us had almost exactly the same amount left and the lady said something like "It's the same even though one group was Japanese!". So we felt pretty good about our chopstick skills. If I hadn't let that whole blob go by we would have won! After the Sōmen we went to get something sweet in the form of an ice cream and I also ate a bit of some sort of weird donut thing. I say a bit because it turned out not to be sweet at all and was very tough- so I ditched it. It was now time to leave the gorge and head to the Amano Iwato Shrine which we reached after a 10km drive. Upon arriving we were once again directed into a car park but were happy to find out that it was completely fee free. The Amano Iwato Shrine (天岩戸神社) is the site of cave in the famous Japanese legend where Amaterasu, the Shinto sun goddess, hides after being teased by her brother. The shrine is located on the other side of the river to the cave which is so sacred you cannot actually approach it. It is possible though to peer across at the river from the shrine if you ask one of the priests. I wanted to do so but it wasn't clear where we had to ask so we ended up skipping that activity and after checking out the shrine we instead walked down a path to another cave that is said to have contained far more gods but is nowhere near as holy. Apparently it was the place where all the different gods and goddesses had discussed how best to extract Amaterasu from the other cave. For some reason or another we had to divert onto the road for a little way and pass by heaps of different ice cream shops filled with treats that looked much nicer than what had just eaten. We really had to suppress our urge to have another round; it would be bad if we had exploded. The trail led along and across the lush Iwato River and as we neared the cave we started to see piles of stones stacked and left by previous pilgrims and visitors. By the time we reached the Amano Yasukawara (天安河原) cave we found thousands upon thousands of stacked stones. It seemed like every square decimetre was covered in a tower! Inside the cave we found a simple shrine surrounded by a myriad stone stacks which continued outside and then countlessly down the river. It was really amazing how many there were! Some were more skilled than others with simple ones consisting of only a few small rocks and other massive stacks comprising over twenty stones. A few of the other visitors were constructing their own towers so we thought we'd join in too. Surprisingly there were still loose stones scattered around which I used to build a stack nine layers high on the top of a pointy boulder (added points). Kate also made a tower but was only able to get it to seven stones tall. While I was building I wondered how often the river floods and what would become of the towers in such an event? I'm sure they'd probably all get knocked over but perhaps those located high up in the back of the cave might have escaped this fate and be quite old. If anyone reading this visits Amano Yasukawara, see if you can locate my stack! I'd be really cool if it was still standing! The day was getting on and it was nearly time to start heading back for our drive to Kumamoto- we had to make sure we caught the 18:02 train to Nagasaki otherwise we'd get in too late. I wanted to visit the Kamiato Oohashi which is a nearby 122 metre tall bridge but unfortunately it was ruled that we did not have time. There was however, time enough for one last visit to the Kunimi-ga-oka (国見ヶ丘 = Country + See + Hill), which is a tall hill from which the first emperor of Japan (Emperor Jimmu) was said to have walked up to survey the land. Today it’s possible to see three different prefectures; Miyazaki, Kumamoto and Oita. It can actually be bit a bit tricky to find online so here's a link to where the hill is located on google maps. This location is also famous as an excellent place to watch the sunrise as when the conditions are right low fog will fill the valleys below and you'll be able to look out over an ocean of clouds. According to a sign these conditions are when there is a clear windless morning after persistent clear weather when the difference between afternoon temperature and the night temperature is greater than 15 degrees Celsius and the humidity is high. Apparently this most often occurs around October. We didn’t have the pleasure to enjoy such a phenomenon but we did spend some time appreciating the view 360 degree views of the countryside. Apparently mount Aso and some of the hills also work to create pareidolia of a sleeping Buddha, though we couldn’t see it due to haze (here is the sign). I did see a love heart shaped cut out in the trees though. 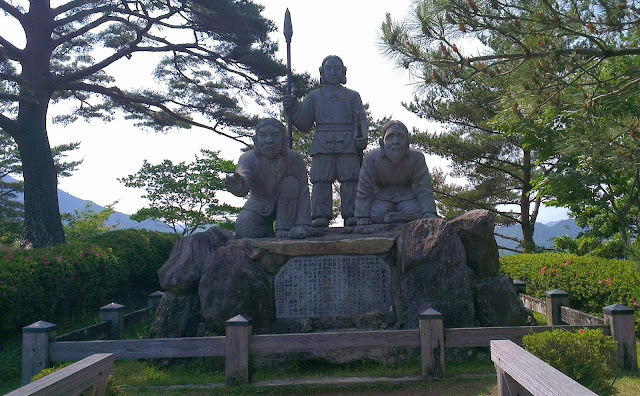 Right at the top of the hill we found some statues that referred to the Emperor Jimmu legend. Once we'd finished admiring the countryside it was time to head back to the car and begin the long trip to Nagasaki. We had about an eighty kilometre drive which took us around two hours on the Japanese roads. As we neared Kumamoto city the driving became congested and pretty unpleasant compared to our earlier trips. It was stop and start with traffic lights and no fun at all. I tried to avoid some of the traffic but only managed to get us lost down some weird side streets. The car rental drop off location was located next to Kumamoto Station and we had to make sure to fill the car up with petrol before returning it. We had a little map that came with our car and listed the different service stations we needed to usel the one we chose had full service with the attendant filling our tank and out our form. We then drove around to the back of the station and found the multilevel car park which contained the car rental place. When we went in a guy waved us down and we parked at the front of their little office. As soon as we arrived the attendants gave the exterior of the car a very quick but thorough inspection and once we hopped out they also checked the inside for damage and lost property. It was all over in about a minute and we passed the inspection! 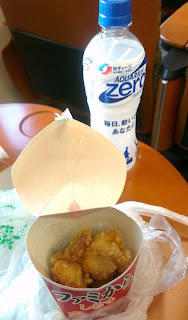 Our train was due to leave pretty soon and we had just enough time to book tickets (with our Japanese Rail Pass) and buy some convenience store food for dinner. Our route involved a shinkansen trip to Shin-Tosu after which we'd catch a limited express Kamome down to Nagasaki. Apparently the Ariake Sea coast line of the second half of the trip is worth especially asking for a left hand side seat, which we did. Upon arriving at Shin-Tosu we realised that this next train was similar to the Sonic we had caught to Beppu a few days earlier and had "around the Kyūshū” written on the side. Darkness descended as we traveled so we were unfortunately not really able to see the coast line very well. Finally, at around 20:22 we pulled into Nagaski after our five hour long journey. 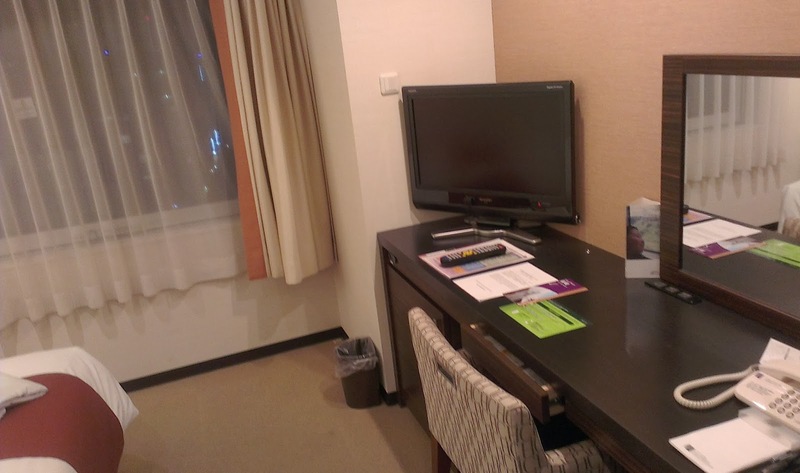 We had booked two nights at the simple buisness hotel Chisun Grand Nagasaki, which is part of the Solare group of hotels. Thanks to some articles I had written on Japan Travel, I had managed to accrue a free night at this hotel! The voucher was mailed to us from Japan and was good for one night for two people. 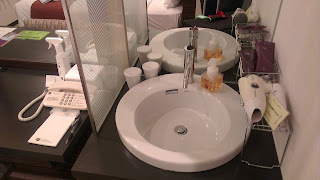 We were told to make sure to email the hotel before use and I had made sure to do so a couple of weeks in advance in both Japanese and English. Unfortunately I didn't receive a reply even though I tried a couple of times. 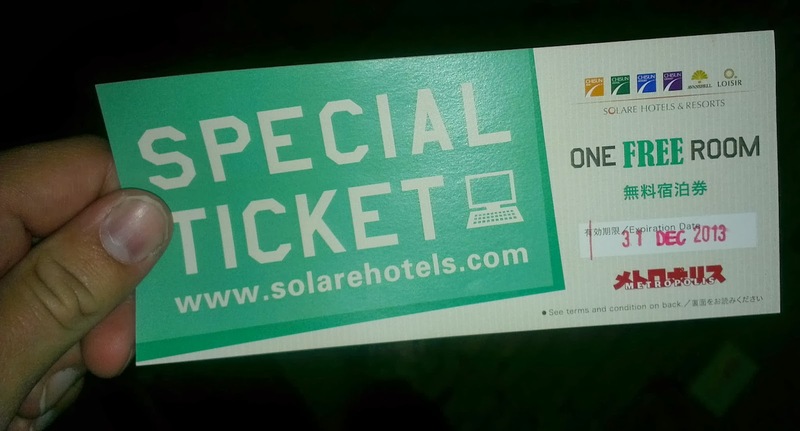 I was pretty scared then to actually present the voucher at check-in as it was specifically made as part of the website so no doubt they'd probably never seen one before. Before facing that potentially awkward encounter we first had to walk the relatively long distance (800m) to our hotel which was located one and a half tram stops from Nagasaki Station. Although we could have got the tram it probably would not have saved a lot of time as getting to the tram platform looked to be a bit of hassle. Plus we'd have to pay. 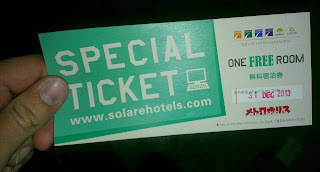 Upon arriving at reception we were shown the price for our two nights stay and I presented our voucher. As excepted the guy behind the counter became concerned and took it away to presumably call the head office. Eventually he returned, said it all checked out, wrote out the price for each night and asked us for what day we'd like to use the voucher for. One night was much more expensive than the other, so we naturally chose to pay for the cheaper option. It was a bit of a weird question. Along with our room key we also received a voucher for the included buffet breakfasts. I apologised for the trouble we had caused and the guy said not to worry as it's part of the service. Once we reached our room we found that our key didn't work so I had to go back down to get it reprogrammed as well! Apart from that the room was quite nice and seemed pretty new. 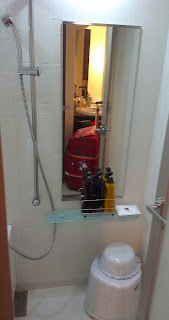 The bathroom was a bit different from what we normally saw at every other business hotel as the whole room was a shower and the sink area was part of the main hotel room. That’s not to say there wasn't a bath in the bathroom though. 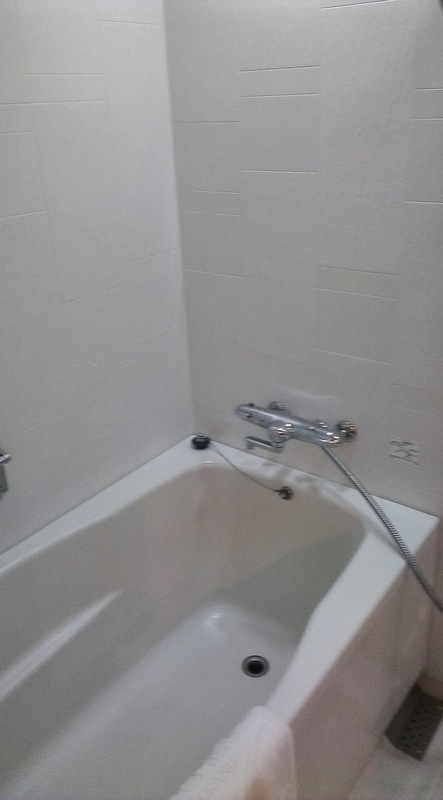 I guess it was basically just a bit more Japanese style with a separate rinse area to use before you soaked in the bath. As for the toilet- it was located in a separate room. Once we'd had a shower it was already quite late so we went straight to bed! Tomorrow we'll be spending a very full day in Nagasaki exploring the city and also travelling out to the abandoned and collapsing Gunkanjima (Battleship) island. Or, are you considering visiting or have you recently travelled to Takachiho? Just to let you know I really enjoyed reading your posts. 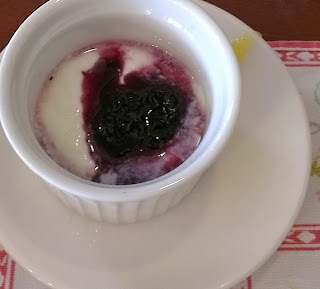 I've come across a number of travel blogs as I plan for my 10-day Kyushu trip in the fall. I think yours is the best I've ever read. In addition to beautiful photos, you provided explanation of the photos and interesting comments with details and humour. I found them very useful and thoroughly enjoyable to read. I will certainly look for your stone stacks at Amano Yasukawara when I visit it :-) Please keep posting! Thank you, Robin. And thank you for the very kind words! Sorry my reply took so long- I'm in Japan (again!) at the moment! Wondering if we could do the same with 2 toddlers?! Boat and the 400 odd steps... hmm challenging. How long was the ride from Kumamoto to gorge? Hmm, if you take it easy and are reasonably active normally I don't think it will be too challenging to climb the stairs. Do you carry toddlers or do they toddle themselves up themselves (I don't know anything about kids! sorry!)? I think you might be able to take your kids on board the boats but they do need to wear life jackets so maybe not (for safety/liability reasons). However! Even without the boats or the stairs its still a really nice place, we'd go even if we could not have done those things, so I still highly reccomend the visit! It's about 2 hours from Kumamoto to the gorge by car, I'd reccomend driving because unless something has changed public transport to and around Takachiho isn't too convenient. I just stumbled on you blog and i really enjoyed reading it... thanks for taking time to add in the history and background etc..